Seth Borenstein at the Associated Press and those pushing for radical wealth redistribution in the name of "climate change" just can't past their hysteria over President Donald Trump's unilateral decision to withdraw from the Paris Climate Accords. Trump's move reversed former President Barack Obama's unilateral decision to sign on. Borenstein's latest exercise in hyperbole on Thursday gave free publicity to a study which absurdly pretends to project the economic impact of alleged global warming over 80 years out. The study's authors appear not to realize that the allegedly frightening impacts they're projecting aren't intimidating at all. Poor and southern U.S. counties will get hit hardest by global warming, according to a first-of-its-kind detailed projection of potential climate change effects at the local level. "Will get hit hardest" communicates certainty, despite the opening sentence's indication that a "projection" is involved. The proper wording should have been "would get hit hardest." But that would dilute the intended sensationalism. In fact, with a very conservative assumption for economic growth, no county in the U.S. will suffer a real "hit" at all. The study, published Thursday in the journal Science, calculates probable economic harms and benefits for the more than 3,100 counties in the United States under different possible scenarios for worldwide emissions of heat-trapping gases. It looks at agriculture, energy costs, labor costs, coastal damage from rising seas, crime and deaths, then estimates the effect on average local income by the end of the century. ... The county hit hardest if greenhouse gas emissions continue unabated is tiny and impoverished Union County in Florida, where median income would take a 28 percent hit. And among counties with at least 500,000 people, Polk County in central Florida would suffer the most, with damages of more than 17 percent of income. Borenstein never told readers that the full effects he identified, if they were to somehow actually occur, wouldn't be seen until the furthest range of the study, between the years 2080 to 2100, and would not happen unless global temperatures rise by 4 degrees Celsius. All of this also assumes an unproven correlation between greenhouse gas emissions, primarily carbon dioxide, which isn't even a genuine pollutant, and increases in global temperatures. The detailed report actually identifies the impact as 1.2 percent of GDP per degree Celsius increase in temperatures. 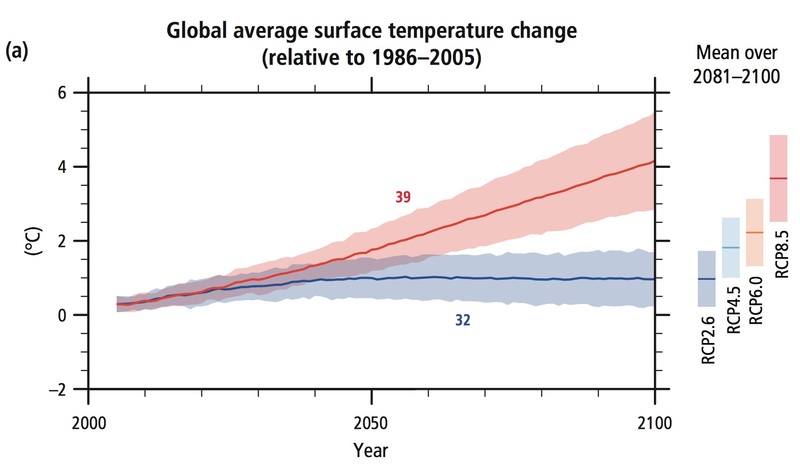 As seen above, if that occurs, temperatures in 2090, the midpoint year in the farthest extrapolated range of 2080-2100 in the Science Magazine projections, would increase by 4 degrees Celsius (rounded up a bit). According to the study, GDP would therefore be 4.8 percent lower (4 times the 1.2 percent GDP decrease for each degree of temperature increase) than it otherwise would have been. That's a truly trifling impact. Really. The easiest, back-of-the-envelope explanation is this: An economy which ends up being 4.8 percent smaller than it otherwise would have been 74 years down the road in 2090 will have grown by a trivial 0.065 percent less per year (.048 divided by 74) on average during that period. The next three tables are for those who wish to see the full detail. Those who don't need it can skip down to the text after the last table. Even the alleged "28 percent (income) hit" projected to be suffered by Union County in Florida would, if one safely assumes that real incomes grow at roughly the same rate as real GDP, mean that incomes would rise by a factor of 4.48 during the next 74 years, and GDP would grow at a 2.05 percent compound annual rate. That's certainly less than desirable, but still a decent improvement, and certainly not a "hit to income." If there's any reason for alarm, it's extremely well-hidden — and keep in mind that the study's authors claim to have taken a comprehensive look at major GDP-influencing factors, including but not limited to violent crime, property crime, mortality, labor supply, and crop yields. Finally, the supposedly frightening 4.8 percent GDP reduction spread over 74 years is significantly less than the impact of just seven post-recession years of the miserable economic policies the nation endured under former President Barack Obama, when growth averaged 1 percent less per year below the 70-year post-World War II trend (2.1 percent vs. 3.1 percent, or a compound total of just over 7 percent). The 4-degree Celsius rise in global temperatures giving rise to the allegedly gloomy GDP scenario cited has to be considered highly unlikely. That's because the same models predicting this temperature rise as a worst-case scenario can't explain why temperatures have barely budged during the past two decades. If properly explained and understood, the vast majority of people would be quite willing to "risk" possible 0.07 percent per year reductions in annual GDP growth relating to something which, based on the track record, is very unlikely to happen — especially because the alternative, as envisioned in the Paris accords and the agendas of those behind it, is to have the world's prosperous nations, particularly the U.S., eventually give up a great deal of their sovereignty and large sums of money. Global warming alarmists and journalists relaying their nonsense are going to have to get better at their scare tactics, because what the study discussed here, and what Borenstein reported, shouldn't scare anyone at all.